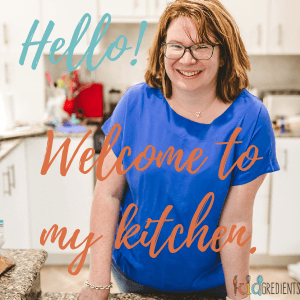 You are here: Home / Recipes / Dairy Free / Raspberry coconut muffins – egg free, no added sugar! During the school holidays I promised my daughter and one of her friends that we would bake some muffins. I called them to the kitchen, we measured flour, baking powder, milk, coconut, raspberries…vanilla…and went to crack in an egg. And yep. No eggs. 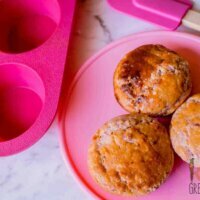 But these raspberry coconut muffins are so yummy, you don’t need the egg! As you can see, they are a little flatter than your usual muffin. And that is because egg plays a very important role in a muffin normally, as it works with the leavening agents in the flour to help the muffins to rise. If you just leave out the egg entirely, you can completely change the consistency of a baked good. So you need to work on a way that will allow you to either substitute the egg or make something that tastes like it was meant to be eggless! That’s where the shredded coconut comes in and the little bit of extra milk and the greek yoghurt. They help to change the texture, making it taste like it was meant to be. The yoghurt helps with the leavening process. 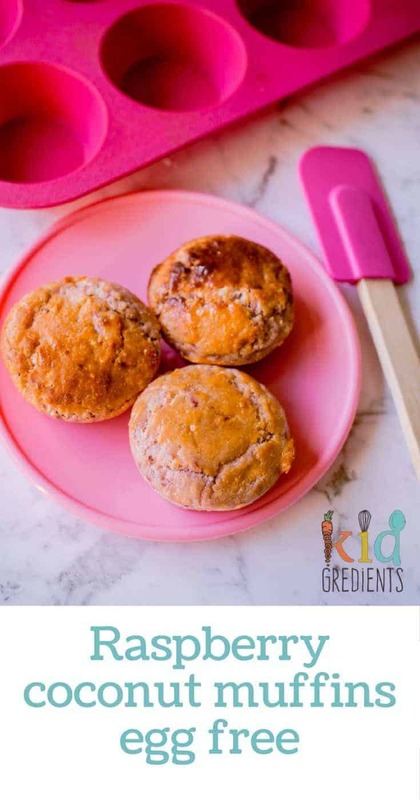 There’s no need for heaps of sugar in these muffins, the vanilla and the raspberries work together to make them sweet enough and the tartness of the greek yoghurt helps to enhance those flavours. We used frozen raspberries, but if you are lucky enough to be able to buy fresh ones without selling your liver, feel free to substitute. These of course are freezer friendly, and lunchbox friendly, with no nuts. You can either defrost them overnight in the fridge before putting in the lunchbox or just pop them straight in the lunchbox in the morning. If you want to make these dairy free, they work quite well with coconut milk and cocoyo, just sub 1:1. 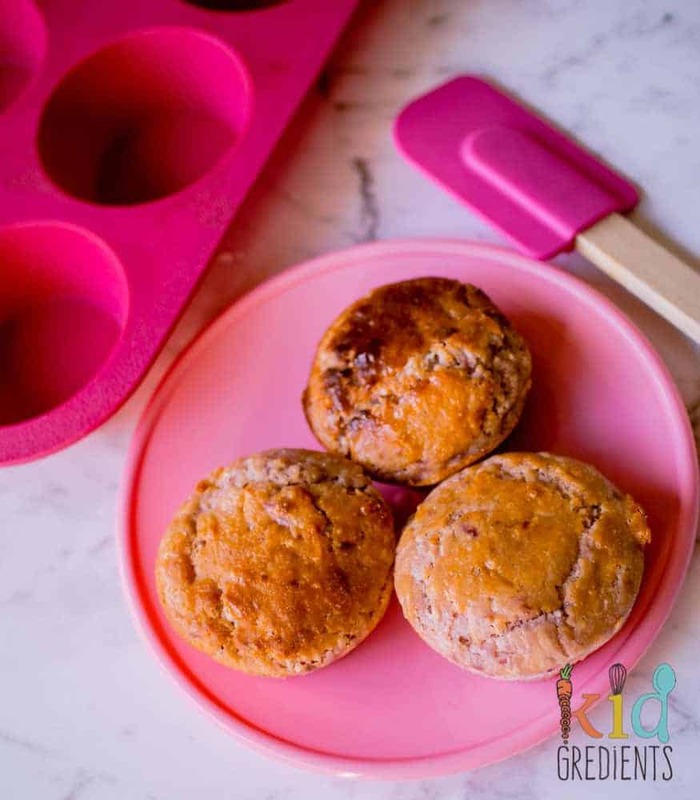 Here are my other muffin recipes that you can do with your kids – an exciting bonding time! 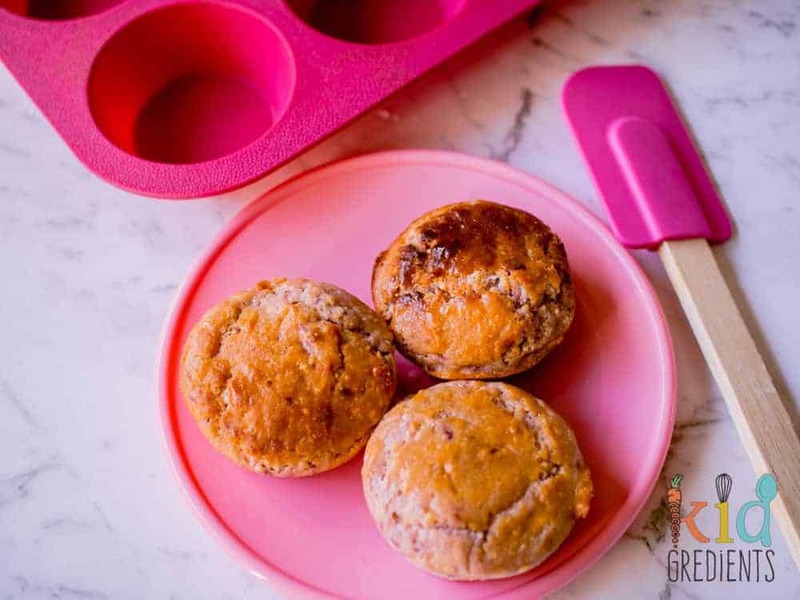 These raspberry coconut muffins are egg free, but super yummy all the same! Perfect for the lunchbox and freezer friendly. You can even make them dairy free. Remove the raspberries from the freezer if using frozen ones and allow to come to room temp. Spoon a tablespoonful into each hole of a silicone muffin tray. Bake at 180 degrees for 15-20 minutes, or until golden and a skewer comes out clean. Freezeable. Freeze on a tray and transfer to a container once solid. Thanks for the idea, I made some today and unfortunately they were not a hit. Needs a sweet additive of some kind whether it’s a ripe banana or maple syrup or something to make it palatable to young (and old!) In the end I Nutella-bombed them (a small amount injected into the centre) to get them eaten! I just made these but they took double the recommended cooking time. Are you using a fan forced oven? Mine is not. They’re also still a little soggy in texture, but perhaps that’s the lack of egg? Oh my gosh, these look AMAZING! I love that they are egg free, perfect for my egg allergy girl. Love that they are freezer friendly too.